Yes, Phoenix has historic homes and historic neighborhoods. Oddly enough though, they really aren't all that old. Phoenix is a young city, so it's historic neighborhoods are pretty much anything older than when the first shopping mall was built. So, in Phoenix an historic home is often anything built before the 1950s. The vast majority of the homes built in the Phoenix area were built from the 1950s on, sprawling out as you see everywhere today. • Central Corridor. This is by far the most beautiful old area of Phoenix. It is along Central Avenue from just north of Camelback Road up to the canal. If you like big trees and gracious estates, nothing in the Phoenix area even comes close. This area was mostly developed between the 1920s and the 1960s, and while there are still houses being built there, they tend to keep with the flavor of the area. 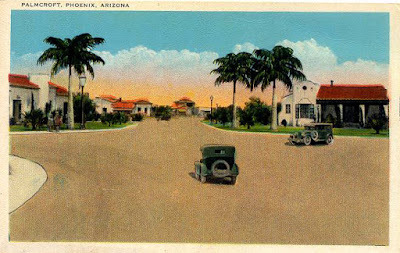 This is the "old money" of Phoenix, and if you can afford to live there, it is a wonderfully dignified place. The trees arch over the road, and people jog and ride horses on the bridal trail. • Phoenix Country Club. Surrounded by hedges and gates, this is the Beverly Hills of Phoenix. Most of the homes were built in the 1920s and 30s, and they are absolutely amazing. Tall trees, manicured lawns. Nothing trendy, very dignified. • Encanto area. I'm sure a real estate expert could give all of the names of the neighborhoods that are south of Encanto Park, but to me, I just call it the Encanto area. Not as expensive as The Central Corridor or Phoenix Country Club, but when you get to the neighborhoods of the 1920s and 1930s that have been restored, you won't even believe that you are in Phoenix. It feels more like Pasadena. Even the beautiful narrow curving roads. So there you go, that's a good start on the historic neighborhoods of Phoenix. Of course there are a whole lot more, as you'll see as you begin your exploration. Enjoy!